You can use options in the Advanced Symmetry box of the Pick tool palette to resize segments. This box is closed by default. Click the arrow on the Advanced Symmetry bar to expand the box. IMPORTANT: Resizing in EasyDraw can be done but it is important to remember that all segments must touch one another or the outside edge of the block for EQ to be able to define the patch and fill it with color. This is more of an advanced technique. 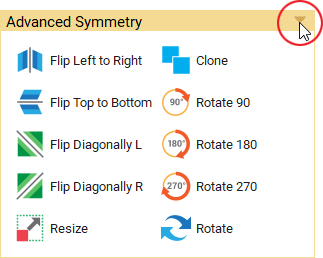 With a segment or segments selected, choose Resize from the Advanced Symmetry box. In the Resize box, use the number entry boxes or click and hold the left mouse button, and drag the slide controls to set the horizontal and vertical amounts. Allowable values are 10 to 300. With a segment or segments selected, move the cursor over one of the side, top, or bottom handles. When it changes to or , click and hold the left mouse button, and drag it to change either the length or width of the selection (as shown below). Use or to drag one of the corner handles if you want to change both height and width at the same time.